Please note that an addendum was issued in February 2019 for this publication, it is available for download and present in both the sample pages and the full PDF. This publication provides general mechanical specifications for new aviation fuel water barrier filter elements for use only on mobile aircraft fuelling equipment. 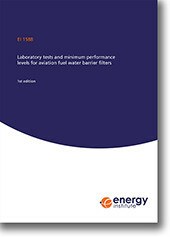 It also provides laboratory test procedures and minimum laboratory performance levels for selected aspects of the performance of water barrier filter elements and water barrier filtration systems. The primary purpose of a water barrier system is to prevent the passage of free water onto aircraft by retaining free water on the upstream side of water barrier filter elements. It also has an ability to restrict particulate matter from passing downstream. It is the intention that particulate matter and/or free water contamination in fuel will cause the differential pressure across a water barrier filtration system to rise to the element changeout DP before the system's ability to remove particulate matter/free water from fuel is exhausted. Water barrier filtration elements may be installed in existing vessels that were previously used to house filter monitor elements meeting the requirements of EI 1583, or in new vessels. This publication will be of interest to filter manufacturers, aircraft fuelling vehicle manufacturers, fuel suppliers, into-plane service companies and airlines.